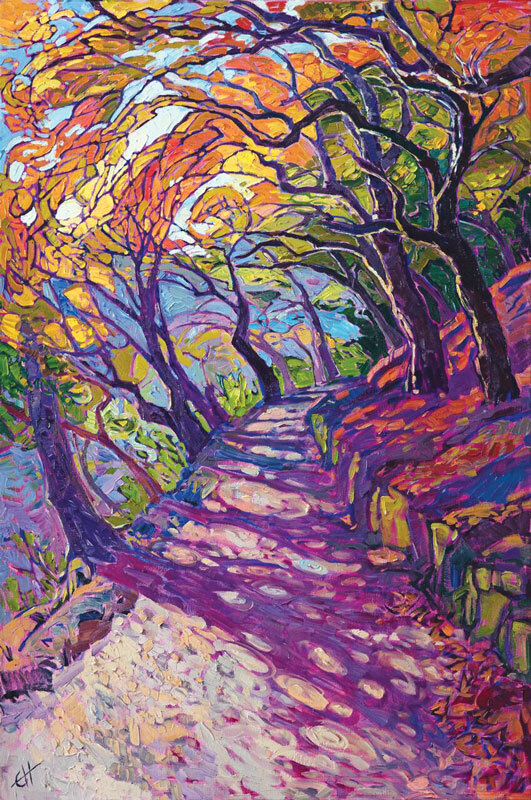 The striking painting above is titled “Mosaic Path” by contemporary impressionist Erin Hanson, a Scripps Ranch resident. It is one of 20 creations in her Fall Colors show, now on display at The Erin Hanson Gallery, 9705 Carroll Centre Road. The collection focuses on Hanson’s love for the unbridled hues of autumn. It includes pieces inspired by her travels through the East Coast, Kyoto, the Pacific Northwest and the southern reaches of Canada. Hanson spent the fall of 2017 traveling to iconic autumn locales in search of premium fall colors at the very peak of the season change. She explored the furthest reaches of Acadia National Park and trekked through the East Coast from Maine to North Carolina. She then set out for Kyoto, Japan, for the ultimate in fall foliage. Visit erinhanson.com. The staff at Scripps Ranch News extends warm wishes to all our readers in hopes that each one will enjoy special times with family and friends on Thanksgiving Day and throughout the holiday season.